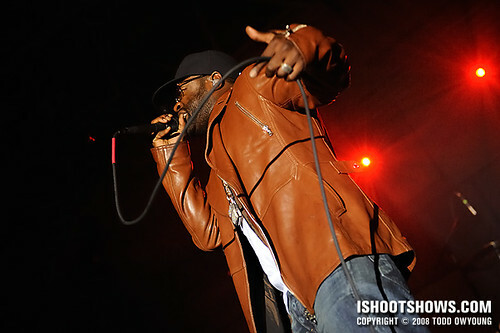 “The ever-elusive hip hop,” riddled Black Thought, pausing between songs. “Is it dead? Is it alive?” By the end of the night, this last question would be answered with a definitive positive in performance by the MC and the Legendary Roots Crew. 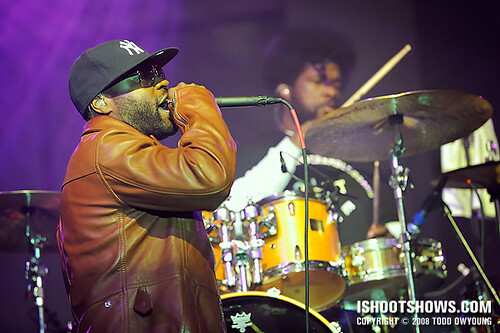 Starting with a humble saxophone solo, the Roots built up their set with meticulous precision, adding one instrument at a time. 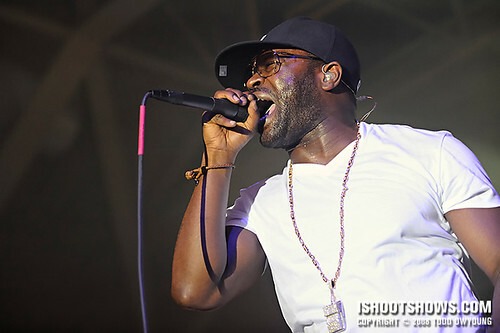 While ?uestlove's appearance to helm his dumset drew the biggest reaction from the crowd, it was Black Thought's fierce delivery on the opening track that truly brought the sonic pyrotechnics for the group's now distinctive performance of live hip hop. 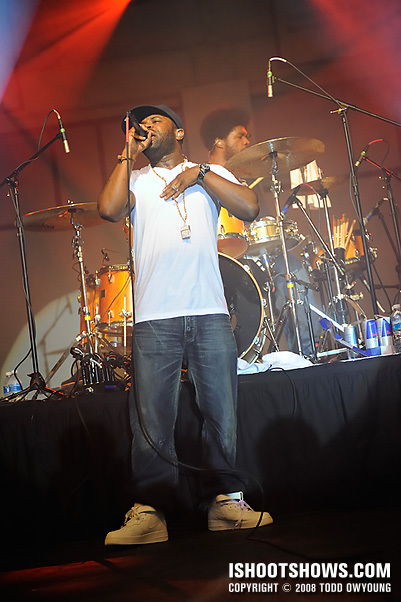 Starting off with “Rising Up, a track fresh off their 10th album, Rising Down (Def Jam, 2008), the crew delivered a charged performance in a two-hour throwdown that shook the rafters and dove deep into the group's back catalogue. 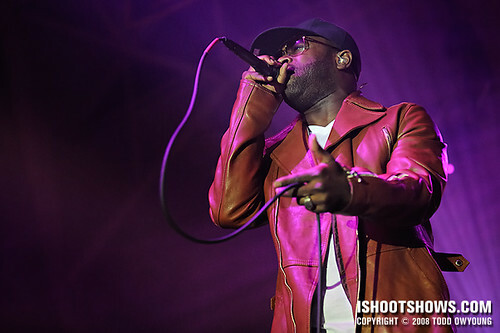 At the front of the stage, Black Thought was a dominating presence, attacking the air with his percussive flow, and whipping the mic cord with flare to match. The next biggest performance, surprisingly, was that of Damon “Tuba Gooding Jr.” Bryson, who rocked the low brass with the endurance of a marathon runner, on stage and off. 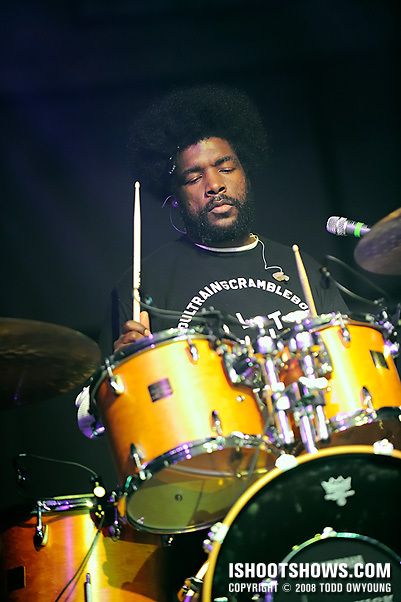 Highlights from the set included an extended tuba solo by Bryson and a pastiche of junk, R&B, and hip hop gems, including Kool & the Gang's “Jungle Boogie,” Biz Markie's “Just a Friend,” and Talib Kweli's “Get By,” among others. 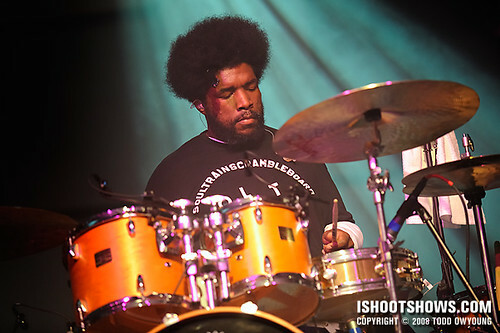 In addition, a drum solo by ?uestlove, in which the house went pitch-black as famed Roots' co-founder used LED-tipped drumsticks, drew wild applause from the audience. 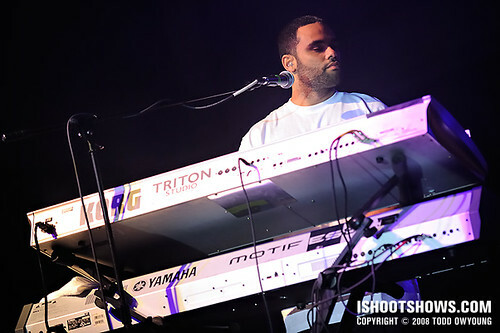 These solos, in which every member participated, further reinforced the uniquely live aspect of the Roots' performance, with not a DAT or turntable in sight. Grinning at the rhetorical question, the MC knew as well as the audience that that couldn't possible be farther from the truth. 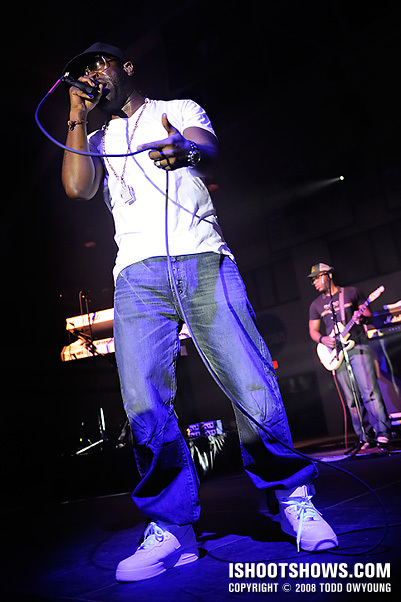 This event was sponsored by Webster University and held in the school's Grant Gymnasium. Walking into the gym, I was very impressed with the big setup, which featured a large stage and two long lighting arrays mounted in the rafters. This was a marked improvement from the Lupe Fiasco show I saw the previous year at Webster, which had what I thought to be great setup at the time. The sound was a great and the lights were on par with anything at the Pageant. I have to wonder how the university could possibly top this show in the same space. Matching the nice lighting setup, this gig had all the trappings of a conventional gig, including a photo/security pit and the standard first three, no flash. Despite the song limit, I shot tremendous number of images during this performance. The jury is still out on whether the new Sandisk Extreme IV 4gb cards I used had an effect, but I never bounced a single frame waiting for the buffer to clear, even with heavy continuous shooting. So far, so good. Overall, the lighting for this show was visually highly impressive as a spectator, especially considering it was a temporary rig. 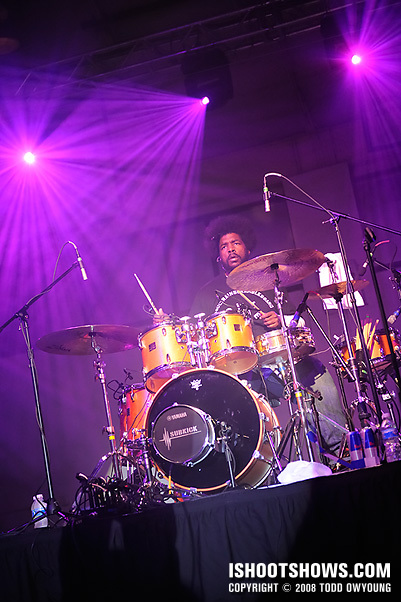 The setup featured almost two-dozen moving-head spots that blasted the stage and venue with wild lighting and plenty of gobo effects. During the first three songs, these spots laid down schemes of red, magenta, and blue, with occasional accents of white and green. A pair of spotlights were positioned front-of-house, primarily tracking Black Thought, though they occasionally lit ?uestlove as well. While two spotlights were in place, only one was used at any given moment most of the time. There was a surprising amount of “smoke” effect generated by water hazers for this performance, so much that it was visibly billowing out of the cavernous space after the show ended. 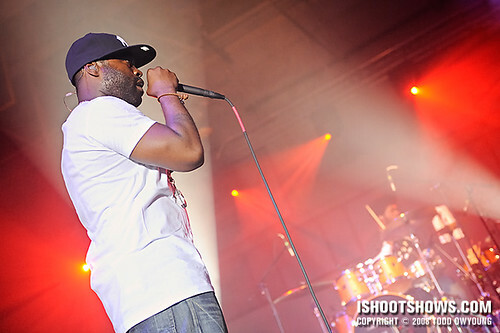 Even with the spotlight on Black Thought for most of the first three songs, exposure was highly variable for this show. The spotlight itself was responsible in part, due to minute flickers in intensity, while slight changes in the exposure across the diameter of the spotlight projection also contributed to changes. With the latter artifact, the edges of the beam show more fall-off than the center, for example. I shot in between ISO 1600 and ISO 3200 at f/2.8 for the most part. Shutter speeds range between 1/200 and 1/400. 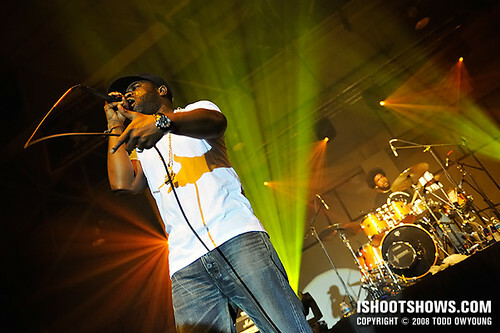 I shot with the Nikon D3 and primarily used the Nikon 24-70mm f/2.8 for this gig. 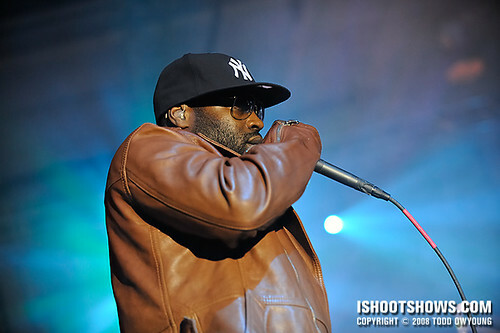 The midrange zoom provided a nice range for full-length shots of Black Thought while also going in tight enough for more head and shoulders framing. 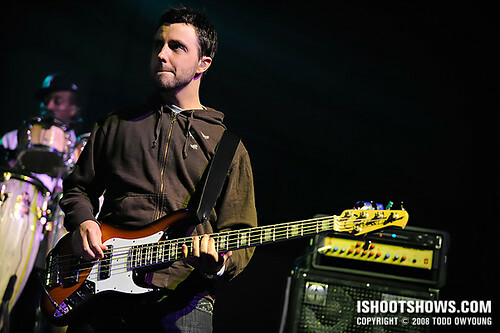 In addition, I used the Nikon 70-200mm f/2.8 VR for its reach across the relatively large stage. The telephoto lens was particularly key for shots of ?uestlove, and the main reason I brought the big lens. 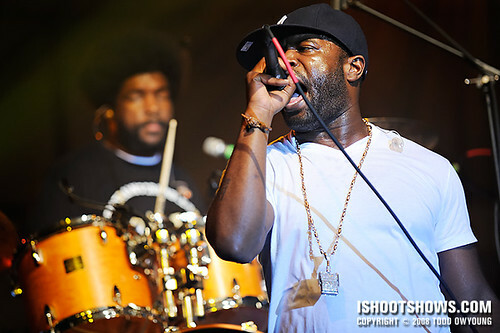 Using the 70-200mm on several occasions, I also made a mental note to make images that included the two co-founders of the Roots, Black Thought and ?uestlove, in the frame together. In addition, I shot a few frames with the Nikon 14-24mm f/2.8, but the ultra-wide angle of the lens was generally not needed for this performance. My ears are still ringing from this show. Or maybe it's just the tinnitus. 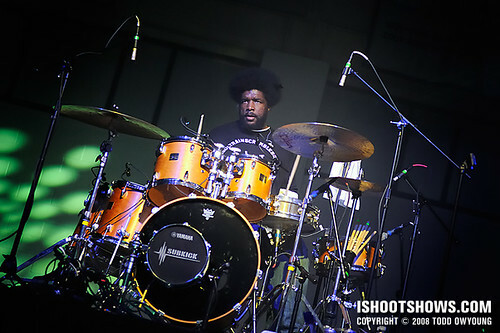 Regardless, this was a fantastic show that delivered on all expectations from the Roots. After having tried to photograph the group for the last two years, this third time was the charm. 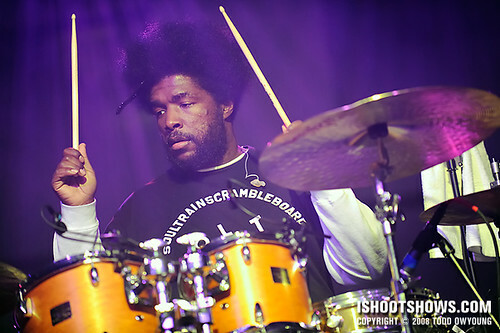 The Roots are opening for Erykah Badu next month in her performance at the Fox Theatre. 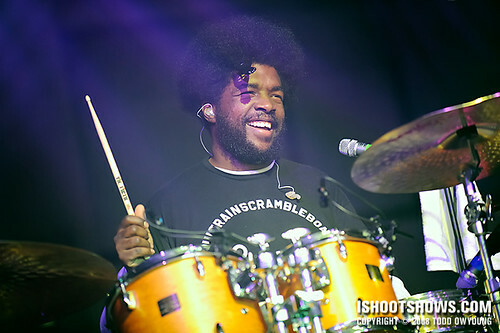 As if the chance to photograph two Grammy award-winners back to back wasn't good enough, this preview of the Roots has me even more excited for the show to come. I especially like the one with the tuba! The symmetry is pretty neat, and the tuba is …unexpected. Concerning the ringing in your ears, high fidelity ear plugs should do the trick. I never leave the house without a pair. Hey Diana, thanks for the feedback, I appreciate it. I liked that tuba shot, too, thanks for your pick. 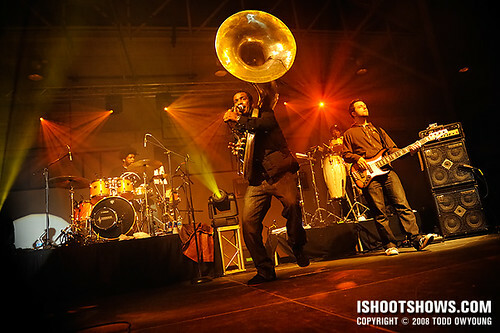 Tuba Gooding, Jr. was truly running amok on stage. At one point he jumped down into the photo pit (well after the first three songs, thankfully, and then proceeded to play down the front row before making a circuit of the stage. I’m considering a pair of custom-molded earplugs. another amazing set Todd, great work. I was supposed to shoot them yesterday at the Green Apple Fest in DC but the lightning got in our way. I love how you captured Black Thoughts intensity. Seems like they’re stashing Captain Kirk in the back now? Hey Ajay, thank you, glad to hear you enjoyed this set. Sorry to hear about that show getting fouled by weather, that’s a real bummer. 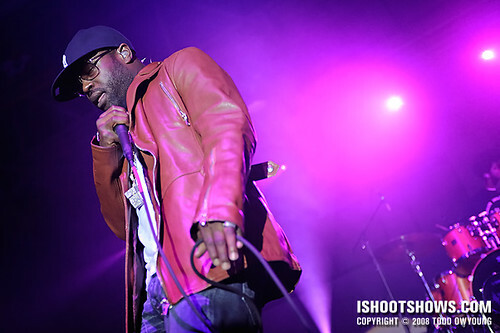 Black Thought was definitely hyper intense on stage – probably the most energetic performer I’ve shot yet, including metalcore singers, which is saying a lot. Thought was always in constant motion, and this close grip on the mic (not to mention the whipping cord) made getting clean shots an interesting challenge. 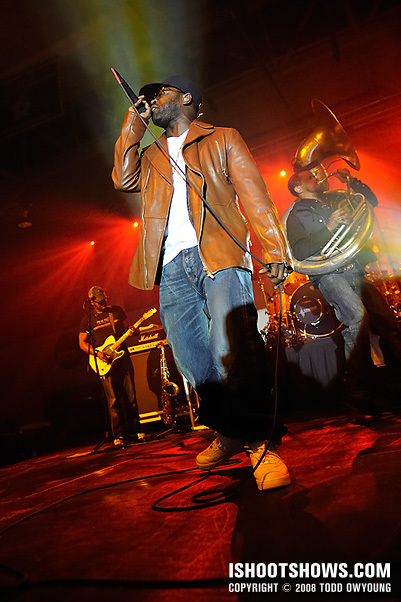 Only Black Thought (and occasionally Tuba) performed at the front – this is the first time I’ve seen the group, are the Roots usually set up differently? The tuba shot on the bottom row second from left is just TOO GOOD man. He looks like he’s running right at you! Nice! I had the chance to saw them live … 3 years ago now i think, it was really cool. Hey G, thanks. 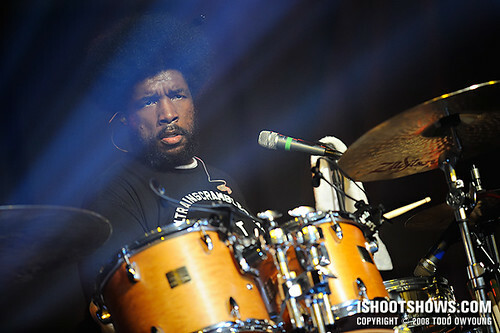 I’ve been trying to photograph the Roots ever since I started shooting live music, so the third time was the charm. They’re also coming back here next month and I would love to photograph them again in a “proper” venuee.